Prof. Peter Schmid, first author, said the results "will change the way triple-negative breast cancer is treated". "Atezolizumab in combination with nab-paclitaxel is the first targeted treatment to improve survival in metastatic triple negative breast cancer," said Schmid, Clinical Director of London's St. Bartholomew's Breast Cancer Centre, Barts Health NHS Trust, UK and lead of the Centre for Experimental Cancer Medicine, Barts Cancer Institute, Queen Mary University of London, UK. "It is also the first immune therapy to improve outcome in this cancer. Most of the survival benefit was in patients with PD-L1 positive tumours." Triple negative breast cancer is the most aggressive type of breast cancer. It is relatively rare and often affects younger women. Once the disease becomes metastatic, the median survival is around 12 to 15 months. Triple negative breast cancer does not have receptors for the hormones oestrogen or the protein HER2, meaning it cannot be treated with hormone therapy or drugs targeting HER2. The main drug treatment is chemotherapy and most patients develop resistance to chemotherapy within a few months. The phase III IMpassion 130 trial enrolled 902 patients with metastatic triple negative breast cancer who had not received prior treatment for metastatic disease. Patients were randomly allocated to standard chemotherapy (nab-paclitaxel) plus atezolizumab, an antibody targeting the protein PD-L1, or to standard chemotherapy plus placebo. The two main objectives were to see whether the drug combination could slow cancer growth (progression-free survival) and prolong life (overall survival) in all patients and in those expressing PD-L1. The median follow-up was 12.9 months. More than half of patients were alive at the time of analysis, so this was an interim assessment of overall survival. In patients with PD-L1 positive tumours, the median overall survival was 25.0 months with the combination compared to 15.5 months with standard chemotherapy alone (HR 0.62). In all patients, survival was 21.3 months with the combination versus 17.6 months with chemotherapy alone which was not statistically different, likely because of the short follow-up. The proportion of patients responding to treatment (objective response rate) was higher with the combination compared to chemotherapy alone for all patients (56% versus 46%) and those with PD-L1 positive tumours (59% versus 43%). Schmid said the combination therapy was well tolerated. Most side effects were due to chemotherapy and occurred at a similar rate in both treatment groups, although there was a minor increase in nausea and cough in the combination group. Side effects related to immune therapy were rare, the most common being hypothyroidism which occurred in 17.3% of patients receiving the drug combination and 4.3% receiving chemotherapy alone. Schmid said: "Immune therapy on top of standard chemotherapy prolonged survival by ten months in patients with tumours expressing PD-L1. This combination should become a new treatment option for patients with metastatic triple negative breast cancer." Commenting on the results for ESMO, Dr Marleen Kok, Medical Oncologist, The Netherlands Cancer Institute, Amsterdam, said: "This is the first randomised phase III trial providing evidence that adding immune therapy to standard chemotherapy increases progression-free survival in metastatic triple negative breast cancer, particularly in patients with PD-L1 positive tumours, and extends overall survival in the PD-L1 positive subgroup. While the benefit in terms of progression-free survival was relatively small, around three months, the gain in overall survival in the PD-L1 positive subgroup was impressive with a ten-month benefit. 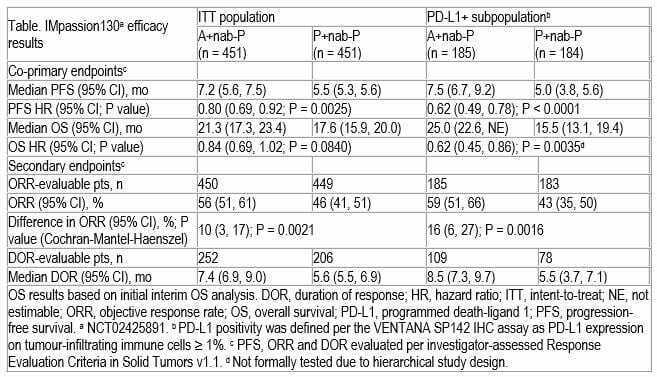 Around 40% of the tumours were PD-L1 positive. The IMpassion 130 data will probably change the treatment landscape for our metastatic triple negative breast cancer patients." Kok noted that it is still not clear what the best chemotherapy backbone is for anti-PD-(L)1 treatment and that many trials are ongoing, evaluating the additional effect of anti-PD-(L)1 on top of chemotherapy in metastatic breast cancer but also for early breast cancer patients. "This should help answer the question of which chemotherapy backbone is most effective in combination with anti-PD-(L)1." she said. "We also need more studies to determine a biomarker for selecting patients most likely to benefit from this treatment." Background: mTNBC is the breast cancer subtype with worst prognosis and is typically treated with chemo. Atezo (anti-PD-L1) combined with nab-P (A+nab-P) demonstrated safety and clinical activity in mTNBC (Pohlmann AACR 2018). Here we report final PFS and initial interim OS results from IMpassion130, a ph 3, double-blind, randomised study evaluating 1L A+nab-P in mTNBC. Methods: Eligible patients (pts) with histologically documented mTNBC, ECOG PS 0-1 and tumour tissue for PD-L1 testing were randomised 1:1 to IV atezo 840 mg or placebo (P) on d1 and 15 (q2w) + nab-P 100 mg/m2 on d1, 8 and 15 of a 28-d cycle until progression. Stratification factors were prior taxanes, liver mets and tumour PD-L1 status on immune cells (positive: greater than or equal to 1%). Co-primary endpoints (EPs) were PFS (ITT and PD-L1+ pts) and OS (ITT and, if significant, PD-L1+ pts). Key secondary EPs were ORR and DOR. Results: At data cutoff 17 Apr 2018, median follow-up was 12.9 mo. In the A+nab-P and P+nab-P arms, respectively (n = 451 each), median age was 55 and 56 y; 57% and 60% had ECOG PS 0 and 63% each had prior (neo)adjuvant treatment. Efficacy data are in the Table. All-cause AEs occurred in 99% (G3-4, 49%) and 98% (G3-4, 42%) of evaluable pts in the A+nab-P and P+nab-P arms (n = 452, 438), respectively. Nausea, cough, neutropenia, pyrexia and hypothyroidism were greater than or equal to 5% higher with A+nab-P. 3/6 G5 AEs in A+nab-P and 1/3 in P+nab-P pts were related to either atezo, P or nab-P. G3-4 AEs of special interest occurred in 8% of A+nab-P and 4% of P+nab-P pts. Conclusions: IMpassion130 met its co-primary PFS EP in ITT and PD-L1+ pts, with clinically meaningful OS benefit seen at interim OS analysis in PD-L1+ pts. A+nab-P was well tolerated, with a safety profile consistent with each agent. This first positive ph 3 mTNBC immunotherapy study highlights A+nab-P as a new therapy for untreated PD-L1+ pts. Disclosure:	P. Schmid: Honoraria from AstraZeneca, Bayer, Boehringer, Celgene, Eisai, Novartis, Pfizer, Puma, Roche/Genentech; Received grants or been supported/had contracted research from Astellas, AstraZeneca, Medivation, Novartis, Oncogenex, Roche/Genentech (all paid to his institution). Dr. Schmid's wife is an employee of Roche. S. Adams: Institution has received research funding for this trial. H.S. Rugo: Grants: Pfizer, Novartis, Lilly, Genentech/Roche, Macrogenics; Other from Puma, Mylan, Genentech/Roche; Grants: Merck, OBI, Eisai, Plexxikon; Other from Novartis, Pfizer, outside the submitted work. A. Schneeweiss: Honoraria: Roche, Celgene, AstraZeneca, Pfizer, Novartis. C.H. Barrios: Honoraria: Novartis, Roche/Genentech, Pfizer, GlaxoSmithKline, Sanofi, Boehringer Ingelheim, Eisai. Consulting or advisory role: Boehringer Ingelheim, Roche/Genentech, Novartis, GlaxoSmithKline, Eisai, Pfizer; Research funding from Pfizer, Novartis, Amgen, AstraZeneca, Boehringer Ingelheim, GlaxoSmithKline, Roche/Genentech, Lilly, Sanofi, Taiho Pharmaceutical, Mylan, Merrimack, Merck, AbbVie, Astellas, Biomarin, Bristol-Myers Squibb, Daiichi Sankyo, Abraxis Bioscience, AB Science, Asana Biosciences, Medivation, Exelixis, ImClone Systems, LEO Pharma, Millennium. H. Iwata: Grants and personal fees: Daiichi Sankyo, during the conduct of the study; Grants and personal fees from Chugai, AstraZeneca, Pfizer; Personal fees: Eisai, Grants: MSD, Kyowahakou Kirin, GSK, Lilly, Novartis, Bayer, outside the submitted work. V. Dieras: Travel expenses: Roche, Novartis, Pfizer, GSK, Eisai, AstraZeneca. Honoraria for serving as a consultant from Roche/Genentech, Novartis, Lilly, Pfizer, Eisai, Nektar, Astellas, AbbVie, MSD, Tesaro, Daiichi Sankyo, Odonate; Honoraria for serving as a speaker from Roche, Novartis, Eisai, Pfizer, Lilly. S-A. Im: Received research grant: AstraZeneca (not related with this clinical trial). Also worked as an advisory board member for AstraZeneca, Hanmi, Novartis, Roche, Pfizer for the last 5 years. V. Henschel: Employee and stockholder of Roche. L. Molinero, A. Husain: Employee and stock owner of Roche. S.Y. Chui: Employee of Genentech and a stock owner of Roche. R. Funke: Roche employee and stock owner. E.P. Winer: Honoraria for consulting: Genentech/Roche. Other honoraria from Lilly, Tessaro and Leap. S. Loi: Research funding to her institution from Novartis, Bristol Meyers Squibb, Merck, Roche-Genentech, Puma Biotechnology, Pfizer. L.A. Emens: Employment at Johns Hopkins University and FDA-CTGTAC; Board of Directors for Society for Immunotherapy of Cancer (SITC); Honoraria for serving as a consultant/on an advisory board for: AbbVie, Amgen, Astrazeneca, Bayer, Bristol Meyers Squibb, Celgene, eTHeRNA, Gritstone, Medimmune, Molecuvax, Peregrine, Replimune, Syndax, Vaccinex; Research funding: Aduro Biotech, Atrazeneca, Corvus, EMD Serono, Genentech, HeritX, Inc., Roche; Royalties from Aduro IND Licensing/vaccine (All other authors have declared no conflicts of interest.